INDIANAPOLIS, IN [Lilly Endowment/OCA] Orthodox Christian clergy and the parishes they serve may wish to take advantage of grant awards being offered through the Lilly Endowment’s Clergy Renewal Programs for 2019. Through its religion grant making, the Lilly Endowment seeks to deepen and enrich the lives of American Christians largely through initiatives to enhance and sustain the quality of ministry in American congregations and parishes. The program is administered by the Center for Pastoral Excellence at Indianapolis’ Christian Theological Seminary. The Lilly Endowment provides funds to congregations to support renewal leaves for their pastors. Renewal periods are not vacations but times for intentional exploration and reflection, for drinking again from God’s life-giving waters, and for regaining enthusiasm and creativity for ministry. Congregations may apply for grants of to $50,000.00 to underwrite a renewal program for their pastors and their families, with up to $15,000.00 of those funds available to the congregation to help cover costs for ministerial supply. “There is no cost to the congregations or the pastors to apply; the grants represent the Endowment’s continued investment in renewing the health and vitality of American Christian congregations,” said the Rev. Callie J. Smith, Associate Director of the Lilly Endowment Clergy Renewal Programs. 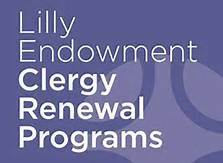 Full descriptions of program guidelines and eligibility and online application materials for the 2019 Lilly Endowment National Clergy Renewal Program and the 2019 Lilly Endowment Clergy Renewal Program for Indiana Congregations are now available. The deadline for submitting applications is April 11, 2019. Lilly Endowment Inc. is an Indianapolis-based private philanthropic foundation created in 1937 by J. K. Lilly and his two sons, Eli and J. K. Jr., with gifts of stock in their pharmaceutical company. The Endowment exists to support the causes of religion, education and community development.